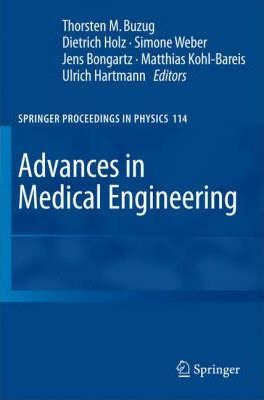 This book offers a lucid and comprehensive account of research and development trends of physics, engineering, mathematics and computer sciences in biomedical engineering. Contributions from industry, clinics, universities and research labs are reviewed. Coverage focuses on medical imaging, medical image processing, computer-assisted surgery, biomechanics, biomedical optics and laser medicine. The book is designed and written to give insight to recent engineering, clinical and mathematical studies. Illustrations note XVII, 477 p.
Continuous improvements in medical imaging together with advanced image processing algorithms, biomechanical simulations and interventional monitoring strategies lead to significant progress in computer-aided diagnosis, treatment planning and therapy. Navigation in image-guided surgery provides significant advantages in accuracy due to today's sophisticated techniques of patient-data visualization in combination with the flexibility and precision of novel surgical tools like robots and laser scalpels. These tools give finer control over sensitive movements in diseased anatomical areas and therefore, allow more surgical procedures to be performed using minimally invasive techniques than ever before. Invited Paper.- Modelling and Imaging Electrophysiology and Contraction of the Heart.- Medical Imaging.- Influence of Corrections During Image Reconstruction on the Spatial Resolution of ClearPET Neuro.- Dynamic Reconstruction for the ClearPET (TM) Neuro Using Temporal B-Splines.- Local Compensation for Respiratory Motion in List-mode PET.- Hybrid Imaging with SPECT/CT - Presentation of 5 Cases.- The ?-MLEM Algorithm: An Iterative Reconstruction Technique for Metal Artifact Reduction in CT Images.- Quantification of Tissue Microcirculation by Dynamic MRI and CT: Comparative Analysis of Signal-Time Courses Measured in Muscle Tissue.- A Numerical Investigation of RF Heating Effects on Implants During MRI Compared to Experimental Measurements.- Real Time Neuronavigation Using 3-D Ultrasound and MRI in Patients with Brain Tumor.- Vasodynamics of the Murine Arteria Saphena by Optical Coherence Tomography.- An Imaging System in the Sub Millimeter Area.- Mutual Attraction of Oscillating Microbubbles.- A new Imaging Data Fusion System for Application in Neurosurgery and Multimodality Phantoms for System Evaluation.- CCD-Video Endoscope Subjected to X-Ray.- MRI Based Attenuation Correction for Brain PET Images.- Integration of Functional Data (PET) into Brain Surgery Planning and Neuronavigation.- Comparison of long-T2 Suppression Techniques for 3D Ultrashort Echo-Time Imaging.- Scatter Analysis of the ClearPET (TM) Neuro Using Monte Carlo Simulations.- Multi-Modality-Imaging for Radiosurgery Planning of Arteriovenous Malformations.- Image Based Analysis of Bone Graft Samples made by 3D Printing Using Conventional and Synchrotron-Radiation-Based Micro-Computed Tomography.- SPECT-CT in Maxillofacial Surgery.- Medical Image Processing.- High Performance 2D/3D-Registration for Patient Positioning in Radiotherapy.- Modelling Tumour Growth Patterns with Non-Rigid Image Registration.- Segmentation and Navigation Support of Clinical Data Sets to Simulate the Bronchoscopy and Rhinoscopy.- Analysis of Body Surfaces in a Body-Fixed Coordinate System.- Deconvolution of Medical Ultrasound Data with Consideration of the Pressure Field, the Excitation Pulse and Focussing.- Evaluation and Enhancement of a Procedure for Generating a 3D Bone Model Using Radiographs.- High-Speed-Camera Recordings and Image Sequence Analysis of Moving Heart-Valves: Experiments and First Results.- Stereoscopic 4D-Visualization of Craniofacial Soft Tissue based on Dynamic MRI and 256 Row 4D-CT.- Analysis of Tumor-Influenced Respiratory Dynamics Using Motion Artifact Reduced Thoracic 4D CT Images.- 3D-CSC: A General Segmentation Technique for Voxel Images with Application in Medicine.- An Algorithm for Automatic Stitching of CR X-ray Images.- Topology Correction in Brain Segmentation Using a Multiscale Algorithm.- Intensity-Modulated Radiation Therapy - Quality Assurance with the Mutual Information Index (MI).- Image Registration of Structural and Physiological MR Images of Abnormal Anatomy.- Computer-Assisted Surgery (MRNV Workshop).- Video Camera Based Navigation of a Laser Beam for Micro Surgery Bone Ablation at the Skull Base - Setup and Initial Experiments.- Ultrasound Based Navigation System for Minimal Invasive Surgery at the Lumbar Spine within OrthoMIT.- Optimization and Quantification of Aaccuracy for Rigid Point Based Registration for Computer Aided Surgery.- Virtual Reality Based Training of Lumbar Punctures Using a 6DOF Haptic Device.- Robot-Assisted 3D-Ultrasound Volume Registration for Skull Bone Surgery.- Recent Significance of Mechatronic Support Systems in General Surgery.- Registration of Intraoperative 3D Ultrasound with MR Data for the Navigated Computer Based Surgery.- Measuring the Fat Content of the Liver for Transplantation Medicine.- Biomechanics.- Influence of Modern Above-Knee Prostheses on the Biomechanics of Gait.- Spinal-Load Analysis of Patient-Transfer Activities.- Investigation of the Influence of Interbody Fusion on Biomechanics of the Cervical Spine Using a Computer Model.- Design and Testing of an Autonomous Computer Controlled Loading Device to Study Tissue Adaptation around Immediately Loaded Implants in the Reindeer Antler.- Numerical Simulation of the Biomechanical Properties of a Prefabricated Attachment System for Use in Prosthetic Dentistry.- Experimental and Numerical Analysis of the Mobility of Immediately Loaded Dental Implants Using a Pig Model.- Measuring System for the Comparative Ergonomic Study of Office Chairs.- 3-Dimensional Foot Geometry and Pressure Distribution Analysis of the Human Foot. Visualization and Analysis of two Independent Foot Quantities for Clinical Applications.- Assessment of Ambulatory Activity of Diabetic Patients: A Reliability Test.- MBS-Modeling for Estimation of Stress and Strain in Human Body.- A Bicycle Simulator Based on a Motion Platform in a Virtual Reality Environment - FIVIS Project.- Inverse Dynamics in Cycling Performance.- Biomedical Optics.- Determination of Alveolar Geometry by Optical Coherence Tomography to Develop a Numerical Model of the Fluid Dynamics in the Pulmonary Acinus.- Combining Optical Coherence Tomography (OCT) with an Operating Microscope.- Measurement of the Epidermal Thickness with Fourier Domain Optical Coherence Tomography in an Occupational Health Study on Natural Sun Protection of the Human Skin.- Multiscale Description of Light Propagation in Biological Tissue.- The Influence of Heterogeneous Optical Properties upon Fluorescence Diffusion Tomography of Small Animals.- Cell Membrane Fluidity Determined by Fluorescence Lifetime and Polarization Screening.- Cholesterol Dependence of Cell Membrane Dynamics Proved by Fluorescence Spectroscopy and Imaging.- Fast and Objective Classification of Tumor Tissue by Optical Vibrational Spectroscopy.- Algorithms for Muscle Oxygenation Monitoring Corrected for Adipose Tissue Thickness.- Establishment of an Optical Imaging Device for Intraoperative Identification of Active Brain Areas.- Parallel FDTD Simulation of the Scattering of Light in Media Containing Cylindrical Scatterers.- Cerebral Oxygenation Monitoring during Cardiac Bypass Surgery in Babies with Broad Band Spatially Resolved Spectroscopy.- Microspectrofluorometry and Polarisation Microscopy of Membrane Dynamics in Living Cells.- Goniometrical Measurements of the Phase Function of Microstructured Tissue.- Medical Laser Engineering.- Comparison of Process Temperature during Laser and Mechanical Cutting of Compact Bone.- Spectral Analysis of the Acoustic Signal During Ablation of Biological Tissue with Pulsed CO2- Lasers.- Laser-Scalpel for Kidney Resection Based on 1,94 m Fibre Laser System.- Three-Dimensional Surface Measurement Using Digital Holography with Pulsed Lasers.- Laser Spectroscopic Online Monitoring of Volatile Diseasemarkers in Human Breath.- Design and Technical Concept of a Tm Laser Scalpel for Clinical Investigation Based on a 60W, 1.92 m Tm Fiber Laser System.- Laser Osteotomy with Pulsed CO2 Lasers.- T-Scan: First Experiences with Acquisition of Cleft Morphology.- Clinical Post-Deadline Papers.- Accuracy of Translation and Rotation Measurements in Navigated ACL Reconstruction.- Stability of Different Attachment Arrays of Reference Bases Against Mechanical Stress.- Problems of the Pre- and Postoperativ Determination of the Antetorsionangle of the Femur by Navigation and CT.- 3D-Analyses and Libraries for the Construction of Individual Craniomaxillofacial Alloplastic Implants.- Evaluation of Various Ceramic Implants after Immediate Loading. Thorsten M. Buzug, Universität zu Lübeck, Institut für Medizintechnik.